Wow!!!!! What a thrill that must have been soaring with the Eagles! Outstanding blog message, Ryan! Loved it all. What was the white on the other side of your trail we could see from your view point? Sand? Or snow? It sure was white for sand, but then maybe you all have white sand in CA? Never been there. Thanks for a thrilling ride, ha ha. I could smell the vomit briefly, ha ha. If you think you're vomiting NOW, wait until you see what I have done to AQ! Mwahahahaaaa!!!!!! 1) I get motion sickness, so I feel for you. When I throw up, I usually do it three times -- takes that many times before my stomach isn't gripping and lurching. 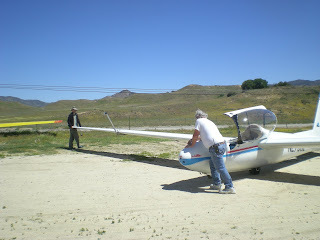 2) I've always wanted to try a glider! Now, hmmm . . .
3) Pedicures aren't just someone dabbing polish on nails. You sit in a massage chair with your feet in a whirlpool. After several minutes of this, your feet are cleaned and pumiced and your feet are massaged clear up the calf! For quite a few minutes, too! 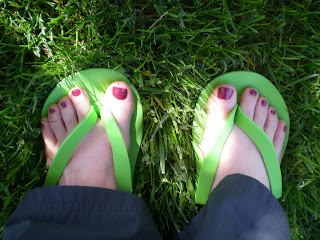 Then finally, your feet are dried, your nails cut into submission and THEN you have polish put on. So, next time, Ryan, get a pedicure and skip the polish step. You'll love it, especially after your long hikes. Gotta love Google adwords. In the margin of this blog entry was an ad for Iams dog food with the headline "Is your dog vomiting?" LOL! Amanda Quote: "He's fine! Keep going!" Love you too Ryan, you always tell us everything!! Cracks me up. Hope you continue to have a safe hike, glad you have other hikers around to hike with you and Amanda as your "Angel". You're a real trooper!! Motion sickness is no fun, but it sounds like a real adventure! If you had told me in advance, I could have sent you an aircraft stamp to plant at that airport. Nasty! Amanda is a saint to have been able to tolerate all that barfing and smell. She's a keeper for sure! I had my gall bladder removed about 9 years ago, and even though I can still feel sick, I've never been able to vomit since it's removal. Unless you'd like to have your gall bladder removed, you'll probably want to carry some of those anti-nausea pills or bands for future motion sickness. Hey, Green Tortuga. I'm back on the PCT doing another section this spring. I finally pulled the pictures/videos off of my camera before heading out here again, and discovered that I HAD managed to capture the video of you & Amanda landing and getting out of the glider. I posted links to the video's in my Postholer journal entry for that day. (I can't seem to find your regular contact information, so hopefully you get this). I know exactly how you feel, Ryan! 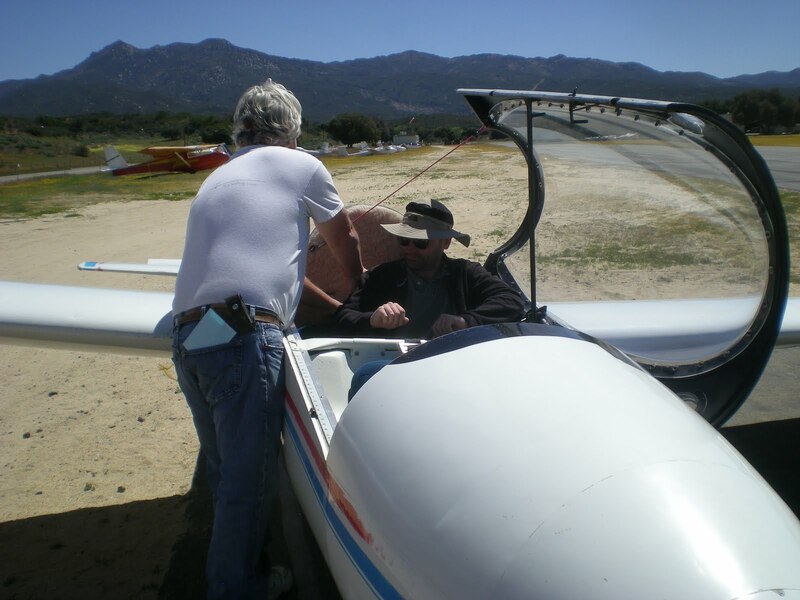 My boyfriend (then husband later) and I were squished into a glider in Calistoga, CA just hours before I met his parents for the first time. I was so sick and the the pilot thought it was hilarious because he thought I was scared and I told him through clenched teeth that I had motion sickness and wasn't scared at all. He immediately stopped doing all his fancy maneuvers and flew straight and level and landed shortly after that. 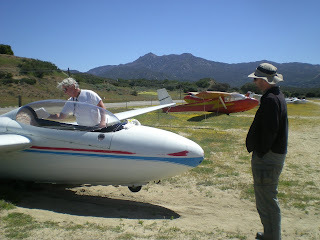 I exited the glider dripping sweat and the people waiting for the next ride wondered if it was really hot in the glider. I told them, "Only if you've got motion sickness." I didn't vomit but fell terrible for hours afterwards. Same thing happened a few years later flying in a small plane over the Grand Canyon. Except I did vomit then - and swallowed it! I've flown in a small plane and a helicopter since then (in AK) but it took 35+ years to try it again! I know exactly how you feel, Ryan! My boyfriend (then husband later) and I were squished into a glider in Calistoga, CA just hours before I met his parents for the first time. I was so sick and the pilot thought it was hilarious because he thought I was scared and I told him through clenched teeth that I had motion sickness and wasn't scared at all. He immediately stopped doing all his fancy maneuvers and flew straight and level and landed shortly after that. I exited the glider dripping sweat and the people waiting for the next ride wondered if it was really hot in the glider. I told them, "Only if you've got motion sickness." I didn't vomit but felt terrible for hours afterwards. Same thing happened a few years later flying in a small plane over the Grand Canyon. Except I did vomit then - and swallowed it! I've flown in a small plane and a helicopter since then (in AK) but it took 35+ years to try it again!